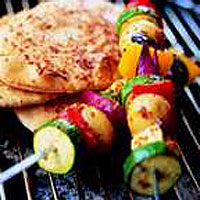 These vegetarian kebabs always go down well and are a colourful addition to any outdoor feast. Boil the potatoes for 8-10 minutes until just tender. Drain and cool. Make the dressing stir the herbs into the crème fraîche, cover, and refrigerate until needed. Whisk the marinade ingredients together in a large bowl, add the vegetables and potatoes and toss to coat. Thread onto skewers, reserving the marinade. Split the pitta, brushing the cut surfaces with the remaining marinade and sprinkle with the Parmesan. Cook the kebabs over a medium heat for 10-15 minutes until golden. Meanwhile, toast the pitta lightly on both sides on the edge of the barbecue. Serve the vegetables in the toasted pitta with a generous dollop of the herb dressing.